As predicted by many, Apple just unveiled the next iPad called “The new iPad” Yes really that’s what it is called! As you can see in the image above, the invitation features a chalkboard-style drawing outlining the skyline of New York, with the addition of the Apple logo in the center. The event is expected to focus on improvements to the iBooks platform with a main emphasis on education and digital textbook publishing. According to rumors the event will try to combine the iTunes U, a free service Apple provides that gives access to educational content, with iBooks. We will keep you updated on where to follow the event over the next few days, so keep checking back. Expect to wait 5-7 Weeks for an iMac with 2 TB Hard Drive! If you were hoping to grab an iMac before Christmas then you may be out of luck, as noted by AppleInsider, shipping estimates for build-to-order iMac models equipped with 2 TB hard drives has increased to an unfriendly 5-7 weeks suggesting that hard drive shortages caused by massive flooding in Thailand over the past several months may be catching up with Apple. What’s interesting is the fact that the Mac Pro models configured with 2 TB drives do not show the same delays, they are still shipping in just 3-5 business days. The 2 TB drive on the iMac is the only drive affected, the drive is available as a build-to-order option on the high-end 21.5-inch iMac and on both base models of the 27-inch iMac. Apple CEO Tim Cook was asked about the potential impact of the Thailand flooding on Apple’s business during the company’s October earnings conference call. Cook noted that there would undoubtedly be an industry-wide shortage of hard disk drives that would primarily affect Apple in its Mac business, but that there had yet to be a full assessment of the impact or an estimated timeline for recovery. He also declined to offer any specific information on the expected impact to Apple, noting only that any such impact was figured into the company’s blockbuster revenue guidance of $37 billion for the holiday quarter. Stanford makes their popular iPhone and iPad App development course FREE for all! The 21st century is the first time in history that you’ve been able to go to college without actually enrolling. Stanford is offering its popular iOS app development course for free in iTunes U. The most up to date version of the course on developing for iOS 5 is available, and any iTunes customer can download class lectures and presentation slides. Online learners hear the same lectures as classroom students, but do not get Stanford credit or access to instructors. Instructor Paul Hegarty attributes the course popularity to the appeal of Apple products and the instant gratification of creating apps for mobile devices. “There’s something about developing for the iOS platform that’s really exciting and fun because it runs on devices that everybody has in their purses or pockets, ” he said. The course from Stanford focuses on topics like “iCloud, streamlined notifications and wireless syncing” in its latest incarnation. The basics of iOS app development are not covered in the course, so you have to already know Objective-C if you hope to learn anything. Stanford students that take the course have already been through a year of computer science classes and object-oriented programming. You can take Stanford’s two prerequisite courses on iTunes U as well: Programming Methodology and Programming Abstractions. Courses are available in both HD and SD video. These development courses from Stanford have already been viewed over 10 million times. While Apple has remained relatively secretive about the event, Apple 2.0 claims to have obtained a list of names who attended the event, including former U.S. president Bill Clinton; U.S. vice president Al Gore, who is a current member of Apple’s board of directors; actor Tim Allen, as well as Bono, lead singer of the band U2. CEOs and chairmen from rival companies also turned out to pay their respects, including Bill Gates, Larry Page, Larry Ellison and Michael Dell, CEO of Dell. 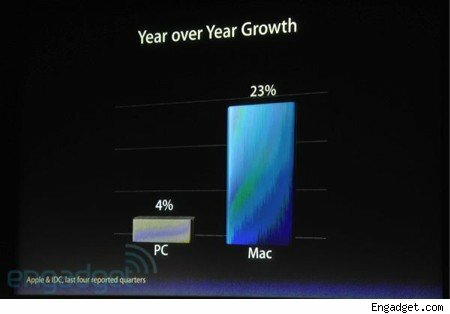 Tim Cook announced yesterday that Apple’s OS X 10.7 Lion has sold more than 6 million copies since going on sale July 20. That’s a whopping 80% more than Mac OS X 10.6 Snow Leopard. Another interesting bit of information Cook threw out there about Lion is that it only took Lion 2 weeks to reach ten percent of Apple’s install user base. Windows 7 took 20 weeks to reach 10% of its install base. Adobe today announced a new cloud-based initiative, with content creation for tablet devices playing an integral role in the effort. As part of that initiative, Adobe will be releasing six new tablet apps to allow users to easily and elegantly design and edit their content. The new tablet apps are being released for both Android tablets and the iPad, with the Android apps set to launch next month. Unfortunately for iPad users, Adobe does not yet appear to have a release date for the iOS version of the new apps for that platform, stating only the an announcement on availability is scheduled for “early 2012”. Inspired by Adobe Creative Suite® software, these stunning new apps bring professional-level creativity to millions of tablet users. The apps address multiple areas of the creative process: image editing; ideation; sketching; mood boards; website and mobile app prototyping; and presenting finished work. 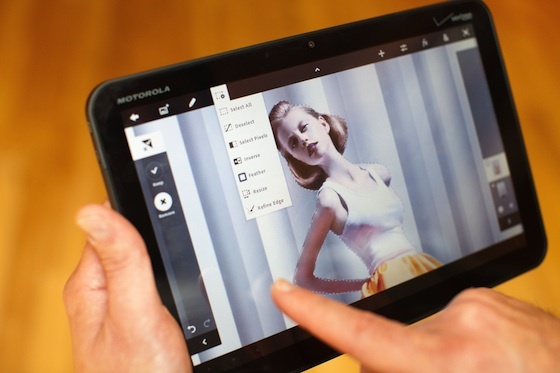 They are headlined by Adobe Photoshop® Touch, a groundbreaking app that brings the legendary creative and image-editing power of Photoshop to tablet devices for the first time. Available soon as standalone apps, Adobe Touch Apps are essential components of Adobe Creative Cloud, a major new company initiative also announced today (see separate release). Adobe Creative Cloud will become a worldwide hub for creativity, where millions can access desktop and tablet applications, find essential creative services, and share their best work. Files created via Adobe Touch Apps can be shared, viewed across devices or transferred into Adobe Creative Suite software for further refinement – key features of Adobe’s vision for the Creative Cloud. – Adobe Photoshop Touch: Image editing and transformation. – Adobe Collage: Photo importing and drawing tools for creating image collages. – Adobe Debut: Presentation software for Creative Suite files. – Adobe Kuler: Color theme generation and exploration. – Adobe Proto : Prototyping tools for websites and mobile apps. Japan has the most advanced earthquake early-warning system in the world. A nationwide online system launched in 2007, it detects tremors, calculates an earthquake’s epicenter and sends out brief warnings from its 1,000-plus seismographs scattered throughout the country, one of the most earthquake-prone nations on the planet. For those who cannot read the text above, it also warns that the feature may reduce your battery life because it is always connected to Japan’s earthquake warning system. This new notification options truly showcases Apple’s commitment to safety for those in Japan. And the Store is back up with…NO changes! Well that was a surprise….the Apple Store is back up with NO changes except for the fact that they have added their educational offer, buy a Mac and get a free Mac App Store gift card. So those of you who were hoping for a new Mac Pro or Mac Mini we are sorry but you need to wait a little longer. With the new iCloud everything seems to have gotten so much easier, you can sync your documents and apps on the go, however furthermore Apple has just announced Photo Stream, which will sync the camera roll on your iPhone or iPad to the cloud, then keep your other devices updated, including your Macs, using iPhoto or even a PC where your photos and videos will show up in the pictures folder. Your last 1,000 pictures will be stored in the cloud, but only for 30 days. Apple doesn’t intend to replace all your local storage, but instead, provide a robust syncing service. So take a photo on your phone. In an instant it is on your iPad, in your iPhoto library and available for big screen display on your Apple TV connected set. Go on vacation, and your pictures will be home before you are. Apple is talking about WiFi, so no word on if the service works over 3G, but we will keep you posted!